The mitochondrial outer and inner membrane each contains a distinct import machinery for translocating proteins into or across their respective lipid bilayers. These two translocators may function either independently of each other or they may align in tandem and cooperate during translocation such that an incoming polypeptide can span both membranes simultaneously (Glick, et al., 1992; Pfanner et al., 1992). The latter situation is particularly relevant to proteins that are translocated, in whole or in part, to the matrix. Among this latter group of proteins may be polypeptides that are subsequently exported to the inner membrane or intermembrane space, via the conservative sorting pathway (Hartl and Neupert, 1990). 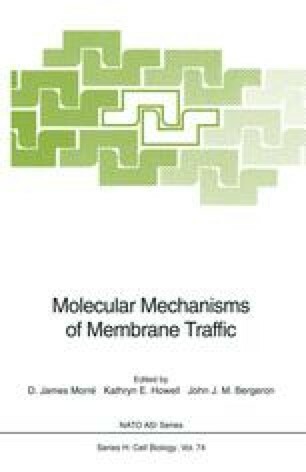 For proteins that are sorted to the outer membrane, intermembrane space, or inner membrane by a unidirectional import pathway, they contain signals that are independently recognized and interpreted by the translocation machineries of the two membranes. This is well illustrated by the inherent problem of sorting to the inner membrane, in which the membrane anchor domain that results in arrest of the imported protein at the inner membrane, must be allowed to pass freely through the outer membrane.